Enterprises of all sizes today want to enhance their business performance by deploying cloud-based ERP solutions and services. Migration from traditional on-premise solutions to NetSuite has proven to be particularly advantageous, due to its flexibility, cost-efficiency, and adaptability to new technologies. Driven by the wide acceptance of NetSuite solutions among businesses, a plethora of technology solution providers have entered the ERP landscape with an aim to further augment NetSuite’s functionalities. Among various other technological upgrades offered by NetSuite partners, big data, data visualization, and artificial intelligence (AI) top the list of new technologies that aim to fundamentally alter the way NetSuite ERP systems are implemented and used by companies. Another cost-controlling trend that NetSuite solution providers are bringing to the table is making NetSuite ERP available for subsidiaries of large organizations. Corporations with multiple subsidiaries can simply deploy specific NetSuite ERP tools that precisely meet the needs of a smaller division. As more ERP systems are being delivered via the cloud, it is becoming easier to deploy such SaaS-based tools incrementally as a business grows. 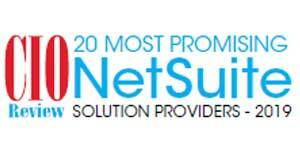 In the last few months, we have analyzed hundreds of NetSuite solution providers and shortlisted the companies that are at the forefront of tackling challenges in the NetSuite solutions arena. A distinguished panel comprising CEOs, CIOs, and analysts including CIOReview’s editorial board has selected the most outstanding ones. In our selection, we looked at the vendor’s capability to fulfill business missions and requirements while providing the right expertise to address the varied and complex needs of industries.